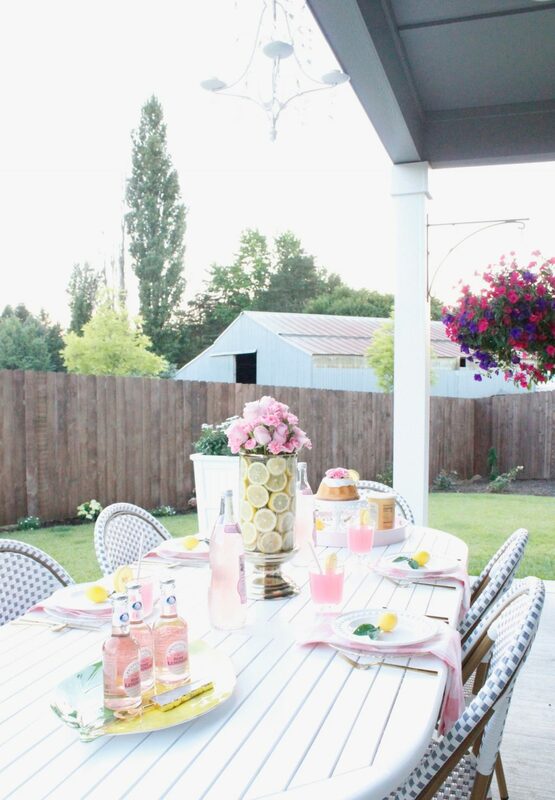 The Seasonal Simplicity Summer series is back today; and this time we’re all about simple summer decor in our outdoor spaces! 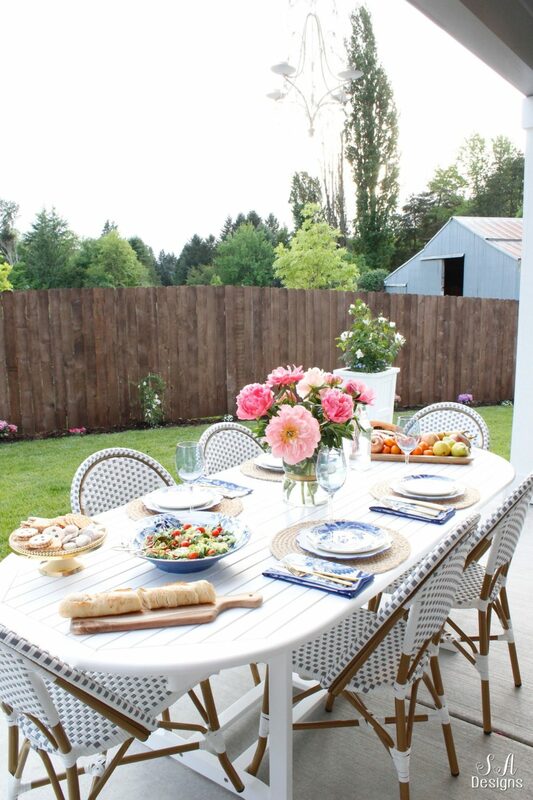 Patios, decks, backyards… bring them on! I can’t wait to take in all the gorgeous outdoor inspiration being shared today. Welcome! And thanks for joining me and my other friends today! Thanks so much to our friend, Krista from The Happy Housie, who is hosting this tour and getting us all together. 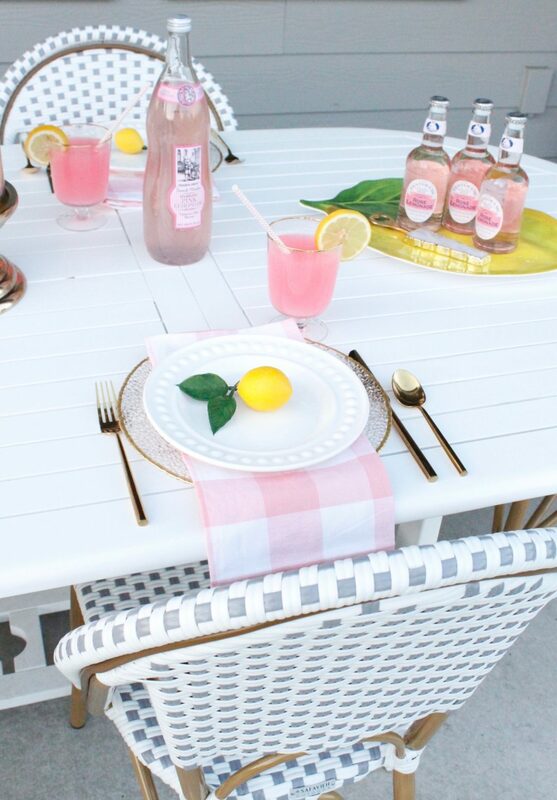 I’m sharing a fun pink lemonade themed outdoor table with you that I created for a Girls Night In. It’s perfect for the summer! If you’re a regular reader, you know that we’ve lived here 7 1/2 months and built this home. All the landscaping is simple and new. My flowers and plants are just babies and newly-planted so I don’t have the mature garden that I dream of…not yet. I just received my back patio furniture last month. You can read all about it HERE and find all the sources. 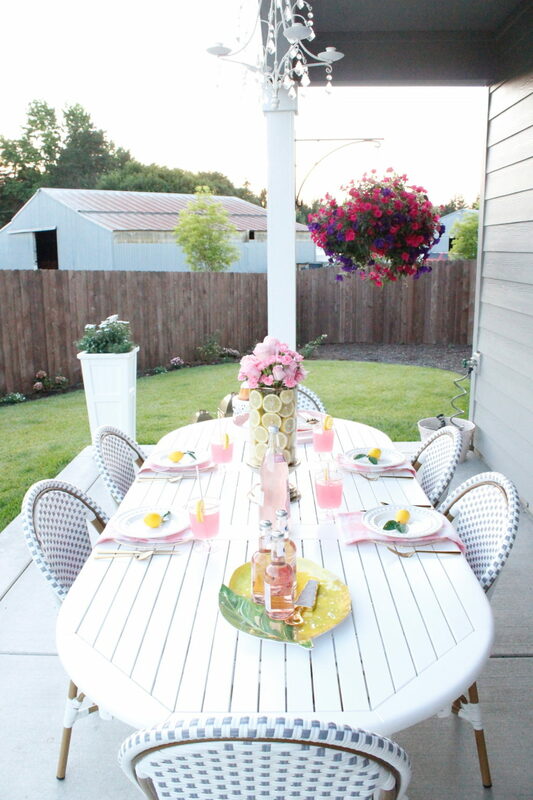 I’ve been loving eating on our back patio most spring and summer nights so far. Weather and insects did not permit that in Texas so we are really loving the Pacific Northwest for that alone. I thought it would be the perfect time to invite just a few girlfriends over for an intimate dinner on my patio instead of going out. 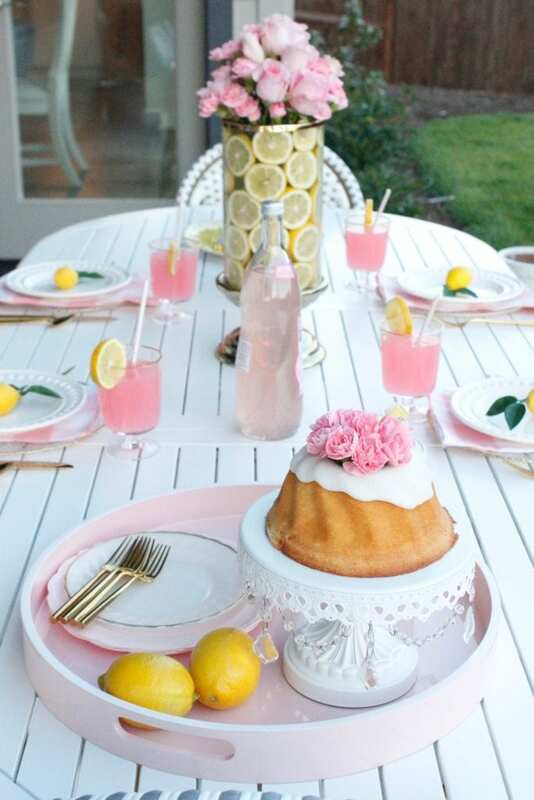 Y’all know I love to set a table and I also love pink. 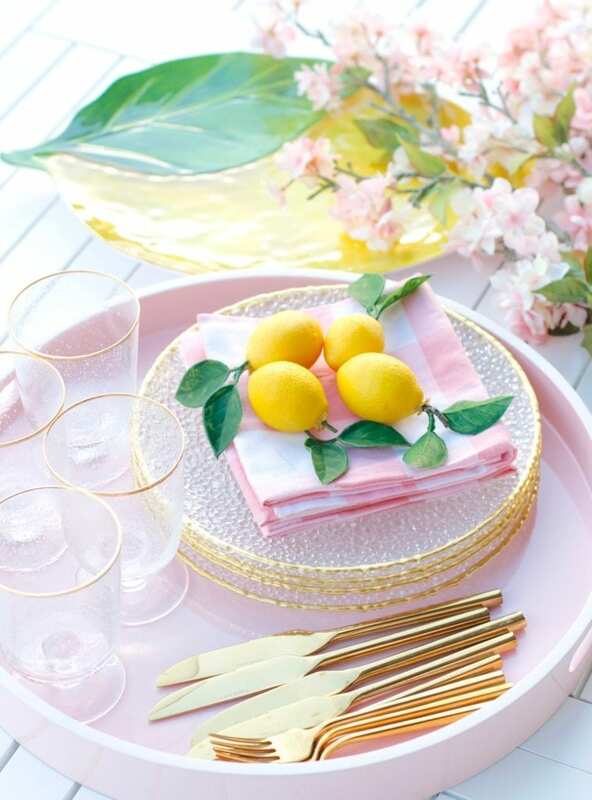 I’ve been obsessed with lemons, this season especially, so a “pink lemonade” theme sounded fun and summery. 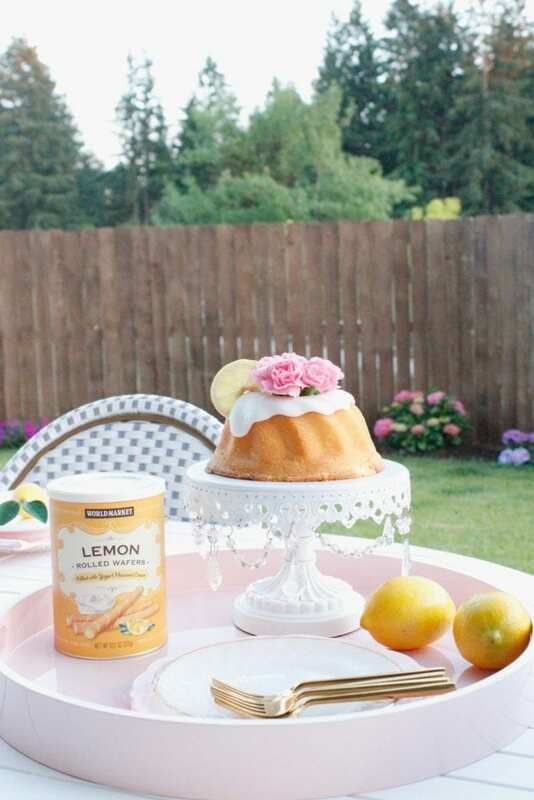 A simple lemon cake from Trader Joe’s with some flowers and lemon garnish was easy and delicious. Last year I made a fruit and floral arrangement with limes that I loved so much so I thought it would be fun to try something similar with lemons for a quick and easy centerpiece. See the tutorial I used HERE. Pink roses and carnations were inexpensive and the only pink flowers at Trader Joe’s (ha!) so I did a fun little mix of those in the center and then sliced lemons around the inside of the hurricane and vase. I clipped lemons from a faux lemon branch and hot glued them to some leaves to make a cute little decor piece for the middle of each plate. You could even tie their name, written on a strip of paper, on the lemons as a place card. All sources are linked below in the “Shop The Post” section except for the trays and hurricane. Those were fun items I found at HomeGoods and couldn’t find the same ones online for you but linked similar items. Speaking of HomeGoods….I was in there last month and found the cutest scallop planter pot. I knew it would be perfect for my lemon tree so I brought it home. 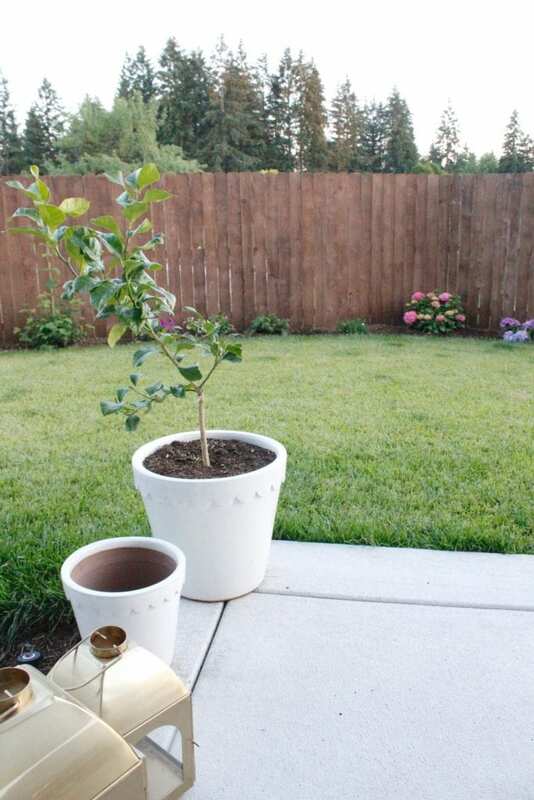 I can’t wait for lemons to grow off those little branches! I have fond memories of going to my grandparents’ home and always picking fresh lemons for homemade lemonade and for lemon water and lemon recipes. I found a matching smaller pot last week so I’m going to grow blueberries in there. And check out my hydrangeas! They are blooming and growing….Woohoo!! We purchased a gray and white striped bistro awning to cover the rest of the patio BUT the guys are still swamped and haven’t gotten to it, ugh. Can’t wait to show that to you when it’s been hung. We still have a LOT to add to our back and side yards. Play area for the kids, a garden, fruit trees, a lounge area, fire pit, fairy garden and more. But I did manage to get my husband a really fun Fathers’ Day gift…. I designed it and made it with the help of my mom, who happened to be in town, and a couple of young men to bring some muscle to the project. I’m hoping to get the tutorial done this week and on the blog so stay tuned! My husband was soooo surprised and loved it so much. Here is my son, Beckham, testing it out. Please visit all of my fabulous friends joining in the tour today! 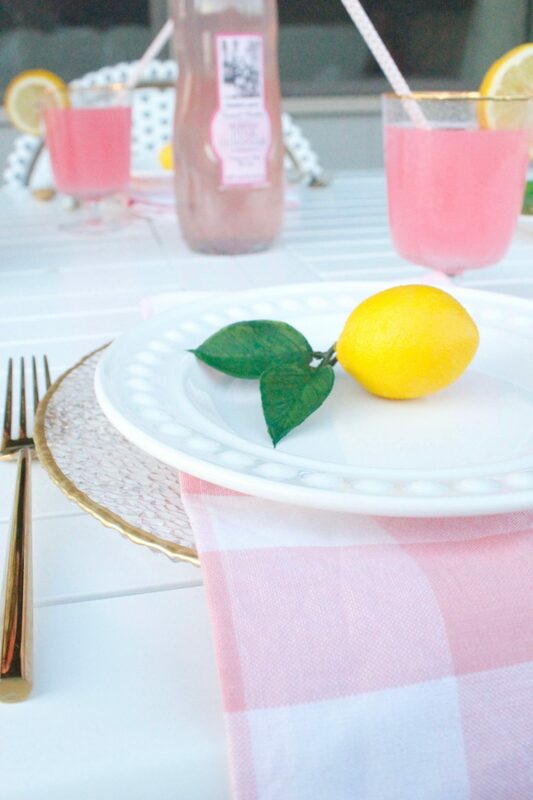 I love your pink lemonade theme, Summer! It’s making me thirsty! 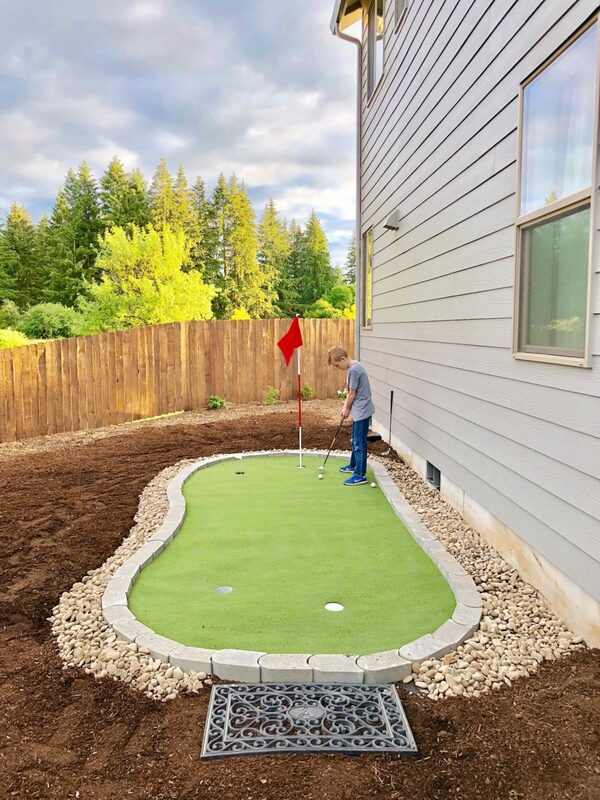 And that putting green?! Love it! Friends of ours have one in their yard, and my boys desperately want one when we build our new house. So glad you could be on this hop! Pink + lemons= perfection! What a darling set up!!! What an adorable space and theme! I especially love the lemon centerpiece! So perfect for summer. I love all of your pretty pink, Summer! So perfect for girls’ night. And that putting green is the cutest! My boys would love that! Hope you’re having a great week! 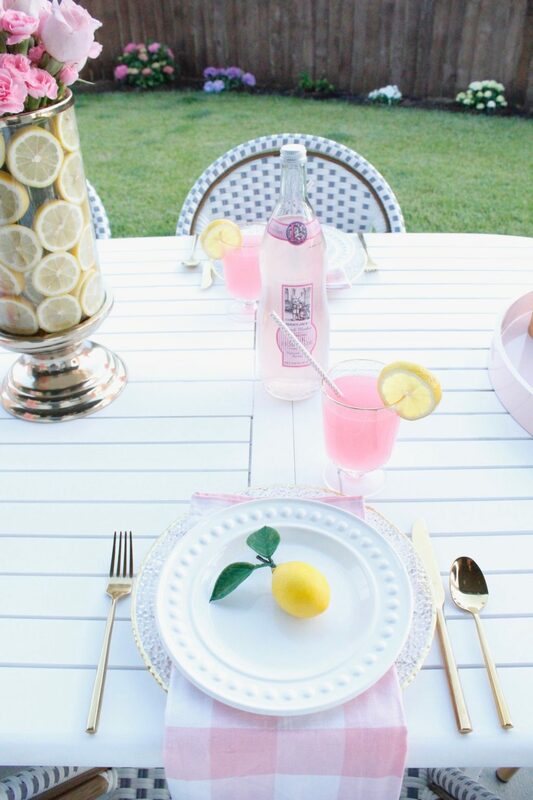 This tablescape is just SO fun! I LOVE the bright, sunny colours and how sweet are all the lemons scattered throughout! SO cute! 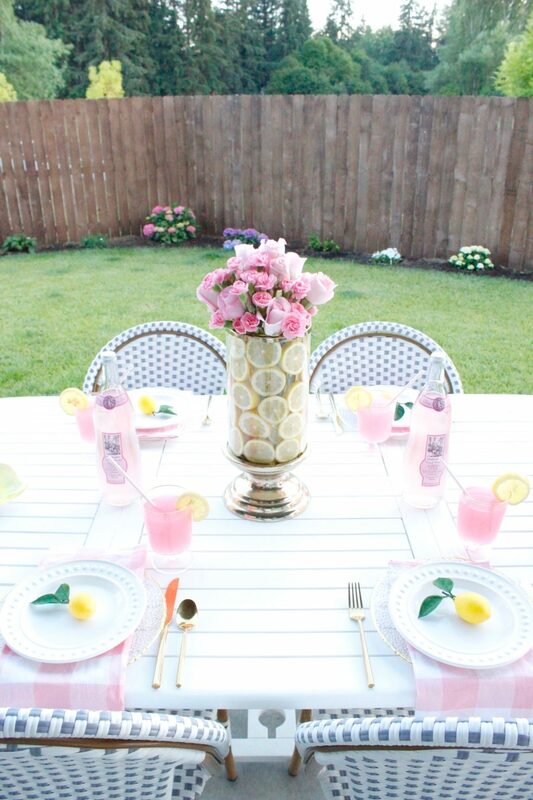 What a fun theme for a summer party…pink and yellow are perfect together! 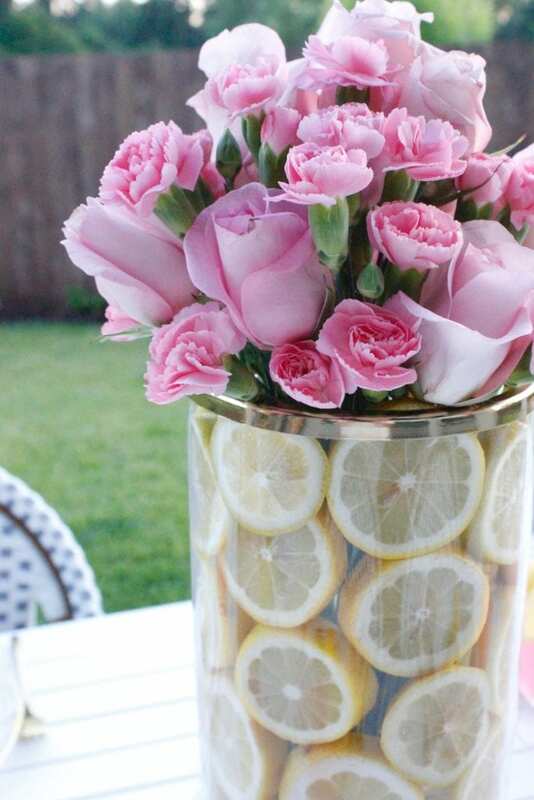 I LOVE your vase with the lemons too! What a sweet way to bring your friends to the table! 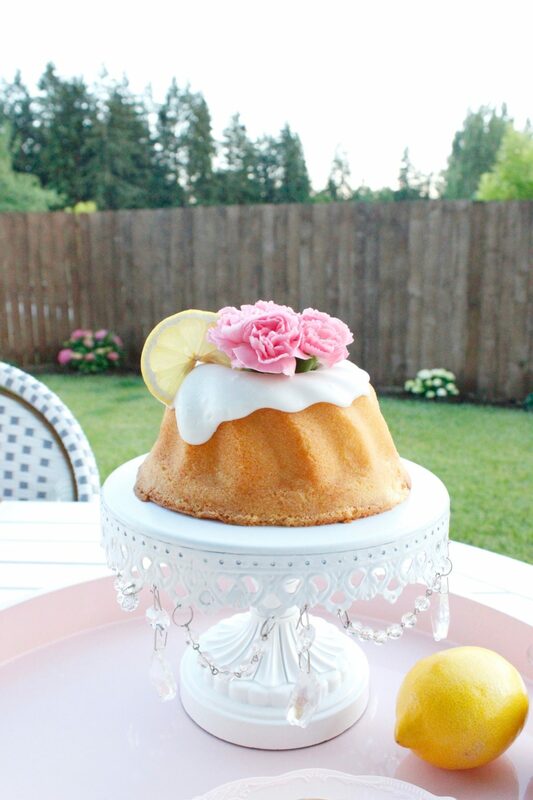 Just lovely with the pink and lemon theme. Clearly Summer is your season!! The table set up is amazing and perfect. Love the flower arrangement and I too have those pink table clothes and they’re wonderful 🙂 Happy Summer! Firstly I love the theme. 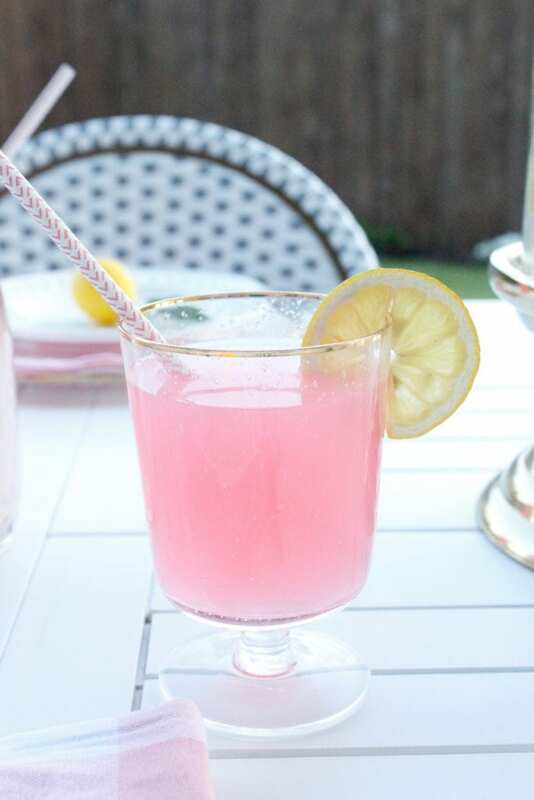 Pink and Lemon brings life to Summer. It’s so adorable, the design and the outcome is perfect. I can’t help to smiling at the the perfect father’s day gift you got your husband, he must head over heels in love with you and excited too. It’s fun and lovely. How did you come up with that idea??? What a gorgeous space! 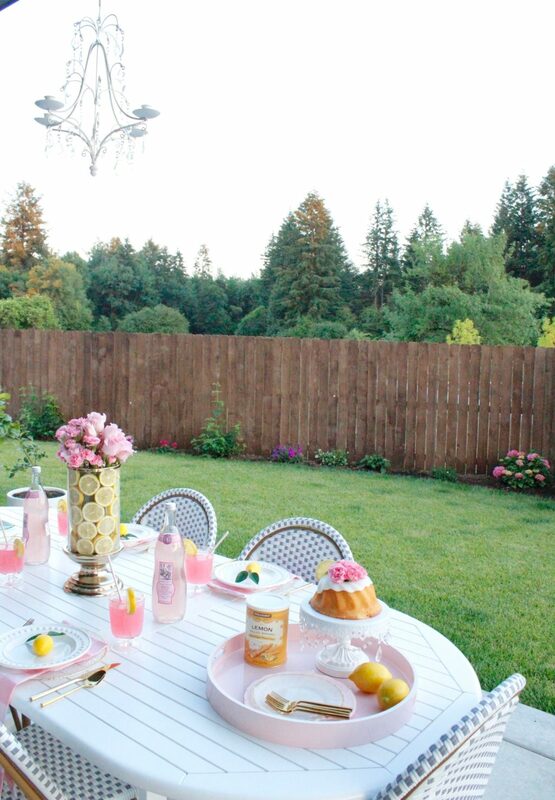 The pink and yellow is so pretty for a girls’ night. And I LOVE the putting green! How fun!